Over the past few weeks, I have been hearing that this new horror movie, ‘Sinister’ delivers the scares and is finally a decent horror film. Something we haven’t seen in at least a year or two. Needless to say, me being the horror maven that I am, I was super psyched when I heard some fellow critics talk about how much they liked ‘Sinister’ and how scary it was. This mix of the paranormal, occult, and solving a murder case has its moments of good, but feels forced in the scare department. 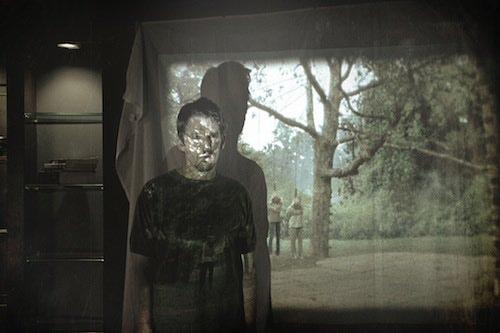 ‘Sinister’ centers on Ellison Oswalt (Ethan Hawke), a true-crime author who has made his living by moving from town to town and investigating grisly murders and writing about them. Oswalt clearly wants to be the next Capote and does not want to go back to his day job of writing fiction and editing instruction manuals. He moves his wife Tracy (Juliet Rylance) and his two kids Trevor (Michael Hall D’Addario) and Ashley (Clare Foley) to a new town so that he can start a new book and investigate a crime where four members of a family were murdered, with the fifth member of the family missing. Oswalt takes it a step further and moves into the house where this crime took place and pretty much immediately, things seem to be off kilter. Even the sheriff (Fred Thompson) thinks Oswalt has poor taste by moving into this house, which Tracy is unaware of. Oswalt discovers a box of old Super-8 film reels and a projector in the attic, all of being labeled as things you’d do with your family such as ‘Family BBQ’ or ‘Pool Time With Family’. Low and behold, each of these Super-8 reels contains sadistic and brutal murders of different families over the past several decades. Here is where things change from detective mode to full on horror mode. 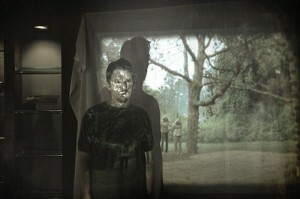 Oswalt discovers that someone is in each of these videos in the distance looking in on the murders. With the help of a local university professor of the occult (Vincent D’Onofrio), Oswalt learns that this mysterious person is actually a demon who is known to eat children’s souls and what to expect from this demon in the future, which there is no good news. There are a lot of good things to come out of ‘Sinister’. Director Scott Derrickson did a good job creating a very creepy atmosphere and good characters. 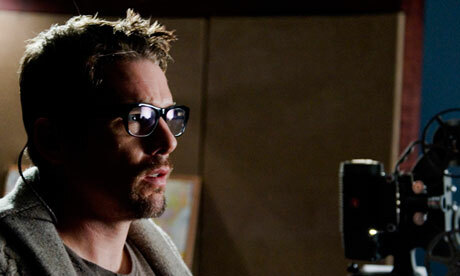 Derrickson directed ‘The Exorcism of Emily Rose’ and the recent remake of ‘The Day The Earth Stood Still’. Ethan Hawke does a great job of being a once successful writer who wants to get back on top, no matter what. There are some intense scenes with him and his wife, which both of them did a terrific job. Yes, Hawke’s character makes some dumb mistakes, but ultimately does what we all would do in a horror film. The script is actually very solid too. One of the best horror scripts written in a long time, thanks to co-screenwriter C. Robert Cargill, who is a fellow movie critic and horror fan. 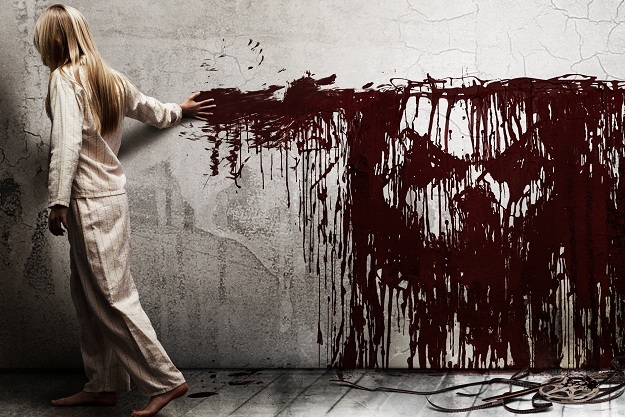 One of the key ingredients to some of the scares in ‘Sinister’ is the score and the music cues. Christopher Young provided the score to ‘Sinister’ and is a mixed bag of creepy electronica and gritty bass. It works and it made the film 10 times scarier. However, a lot of the scares felt forced. There was a lot of creeping around the quiet house, looking for that loud and strange bump in the night, only to have the sound go completely silent, then suddenly a loud burst of sound with a quick peak at the mysterious figure. There was a lot of that. While that may make people jump, it is almost immediately followed with laughter. It’s a scare that doesn’t stay with you, and it feels forced upon you. However, there is just a hint of the psychological horror to ‘Sinister’ that has actually stayed with me as I write this review. But it was not enough to really frighten me. I have no doubt people will jump during ‘Sinister’, and even feel a little bit scared upon arriving home after viewing the film, but this was not the horror film I was hoping it to be. It’s a step in the right direction, but not quite there yet. This entry was posted on Thursday, October 11th, 2012 at 8:10 am	and is filed under Film, News. You can follow any responses to this entry through the RSS 2.0 feed. You can skip to the end and leave a response. Pinging is currently not allowed. « Here’s the new Trailer for Tarantino’s ‘Django Unchained’!! !